Knox was born into one of the City’s wealthiest families. A Patron, he has everything a boy could possibly want—the latest tech, the coolest clothes, and a Proxy to take all his punishments. When Knox breaks a vase, Syd is beaten. When Knox plays a practical joke, Syd is forced to haul rocks. And when Knox crashes a car, killing one of his friends, Syd is branded and sentenced to death. Syd is a Proxy. His life is not his own. Then again, neither is Knox’s. Knox and Syd have more in common than either would guess. So when Knox and Syd realize that the only way to beat the system is to save each other, they flee. Yet Knox’s father is no ordinary Patron, and Syd is no ordinary Proxy. The ensuing cross-country chase will uncover a secret society of rebels, test both boys’ resolve, and shine a blinding light onto a world of those who owe and those who pay. Some debts, it turns out, cannot be repaid. Alex London presents us with a futuristic world where everything is digital. 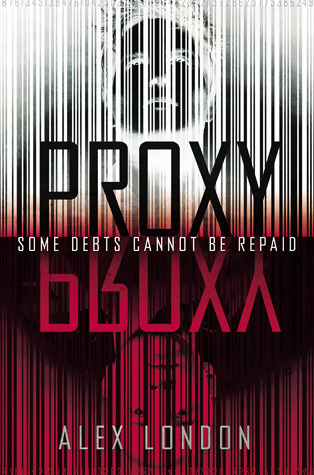 Proxy, his debut novel is the first book in a promising new series. I found both the characters and world-building to be captivating as I read this action-packed tale. Three world review: thriller, captivating, page-turner. The tale is presented to us from two points of view. First we have Knox, a Patron and son to one of the wealthiest men in the city. Next we meet Syd an orphan who lives in the valve. The world is completely digital and everyone is linked to the data but their worlds are completely different. Every Patron is matched to a Proxy. In order to settle his debts for housing, school, food, and medical attention the government made Syd a Proxy. Since he was a small boy he has received a punishment for Knox's mistakes. The two have never met, but Knox has had to witness Syd taking his punishment. When Knox crashes his car and kills his friend Syd is branded and sentence to a life that will surely mean death. When Syd escapes the only person who might be able to help him escape is his Patron and the tale that unfolds is fast-paced, action packed and suspenseful. The characters in London’s tale are fascinating and complex. Each carries their own emotional burden. Syd is smart, level headed and determined to be free of debt. He works on gadgets fixing and repairing them off the grid. He is comfortable with his homosexuality even when others become aware of it and I loved the way the author portrayed him. Knox is your typical spoiled rich kid, who cares more about his next hook up then the consequences of the world around him. As we peel back his layers we see anger, loss and growth. Marie is another Patron and doesn’t like the social system. She is strong and ready to fight for the causes she believes in. While at times I wanted to see a little more depth from the characters and glimpse more into their psyche I ended up liking them. Knox is driven by his hatred of his father, Syd by fear and Marie by the cause. There is no romance although we do get to laugh at a few kisses. The banter and tension between the characters was hilarious one moment and sad the next but it helped us gain insight. London spun science-fiction twists into this dystopian world making it a fast paced and compelling read. I thought the world building was well done, especially the picture he painted of the valve and Upper city. As they traveled away from the city the tale almost had a western feel to it. The gadgets, technology and science fiction aspects were fascinating from the Guardians (guards, government police) to what makes Syd special. The tale at times was dark and intense as we faced both death and spine-tingling chases. The points of view goes back and forth between Syd and Knox and I thought it was well done. The interaction between Knox and Syd are my favorite as we witness growth, trust and reflection. The author effortlessly weaves a few social issues into the tale and allows us to both see the absurdity in them and the consequences. My only real complaint was that I wanted more depth both in the characters and the world but of course I am greedy! The ending was climatic and I am anxious to see what book two has in store for us. Fans of fast paced dystopians with science fiction elements will want to read the Proxy. Guardian the second book is due out in 2014 and I am anxious to visit the world and it’s characters again. I love the premise and the cover of this one! it sounds really interesting, I'm a bit burnt out on the dystopian genre but I might enjoy the sci-fi elements. The characters each sounds intriguing! It was a little science fiction, a little dystopian! This does sound quite interesting! Love your review! I am always up for a thrilling page turner. I was wondering about this book the other day. It sounds very interesting even if the world building and characters are wanting, I might just have to try it! I love dual povs as well! There are some intriguing concepts in there. I don't think I'm up for any more dystopians at the moment, but I'll keep this one in mind. Good review as always, Kimba! thanks Trish, I enjoyed this one. Yeah it was cool watching them become friends. I agree Getty and think this was a really good start..i just want more and hopefully book two will satisfy those needs. I was glad they sent this to me because it was new to me as well. This sounds like an interesting novel. Generally, I like my characters to have a lot of depth, but I have come across books where characters are all right but not that deep, and I still liked it because of other elements. This sounds like that kind of book with its fast pace, since you said the characters were ultimately likable. I might get a copy some time. This sounds like a pretty good book, and I have read and enjoyed books with only passable characters if there are other strong elements, which it sounds like it has, so I might pick it up if I see it around somewhere. I'm interested to see how the whole idea of the proxy is justified by the law. This book sounds very interesting, and I have found that sometimes other story elements make up for only moderately developed characters, so I might give this one a try sometime. Getty, Discus keeps flagging your comments as spam, let me go try and whitelist you. Sorry for the multiple posts. Whenever I wrote one, it wouldn't come up, so I thought they weren't being successfully posted. Then they all went up at once, even though I'd only attempted to post once every couple of hours. Must be a glitch with my computer. While normally I want really well developed characters in a novel, I've found that if other elements are appealing enough they make up for only adequate characters, and this book sounds intriguing so I might give it a try sometime. I'm really interested to see how the government rationalizes the usage of proxies, and whether the proxies are actually believed to benefit society or the government is just ruled by people who doesn't want to deal with consequences. why thank you cupcake, I enjoyed it! I think it was a solid start! I am glad I read it! I love getting lost in libraries! it was different and I liked that the main character is unique, and not a stereotype. It has a strong sci-fi base, and these proxies not only take punishment, but give blood if Patron is injured etc. Thanks Melissa. I find it very difficult to buy into the premise of this one...and if the character development is a bit lacking as well...I think I can pass on this one. I really love hi-tech sci-fi worlds and have read so many amazing reviews for this lately I'm definitely excited to read it. Glad you enjoyed the characters and the worldbuilding. Great review!